Patchwork n Play: Star Jump 4, and a giveaway! Star Jump 4, and a giveaway! pattern for Jess @ Elven Garden! I had some Ikea "Numbers" for the backing. utilitarian is what I call it! I intend it to be used and loved! Jess calls this pattern "Star Jump"! 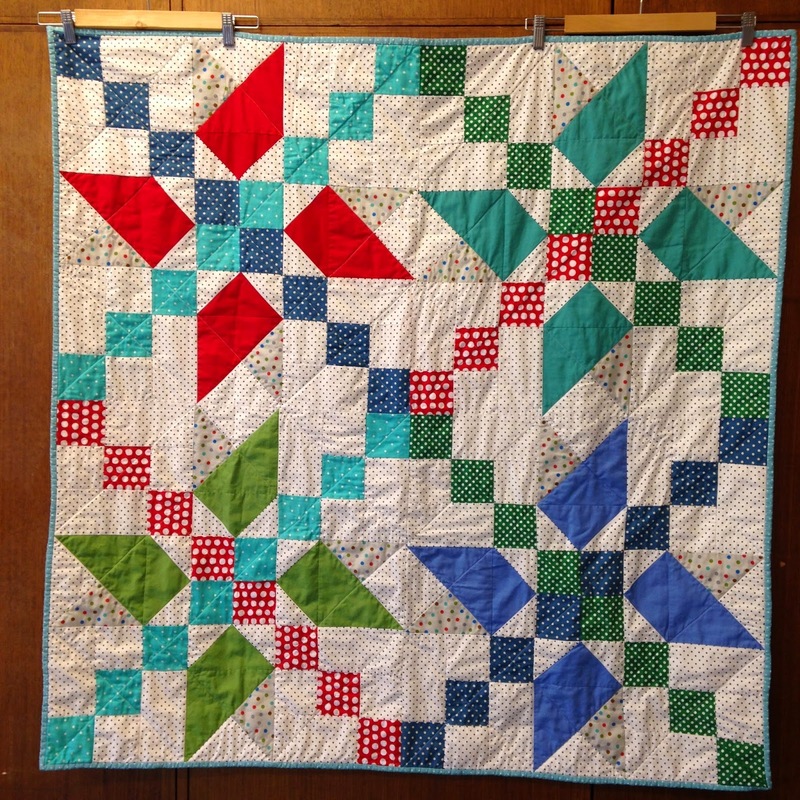 I named my quilt "Star Jump 4"! Jess has kindly offered one of these "Star Jump"
patterns to a lucky reader of my blog! Nice work Suz! (and Jess, of course). Less quilting is more cuddly, for sure. Plus it's a lot quicker! What a fun quilt, especially with all those spotty fabrics! 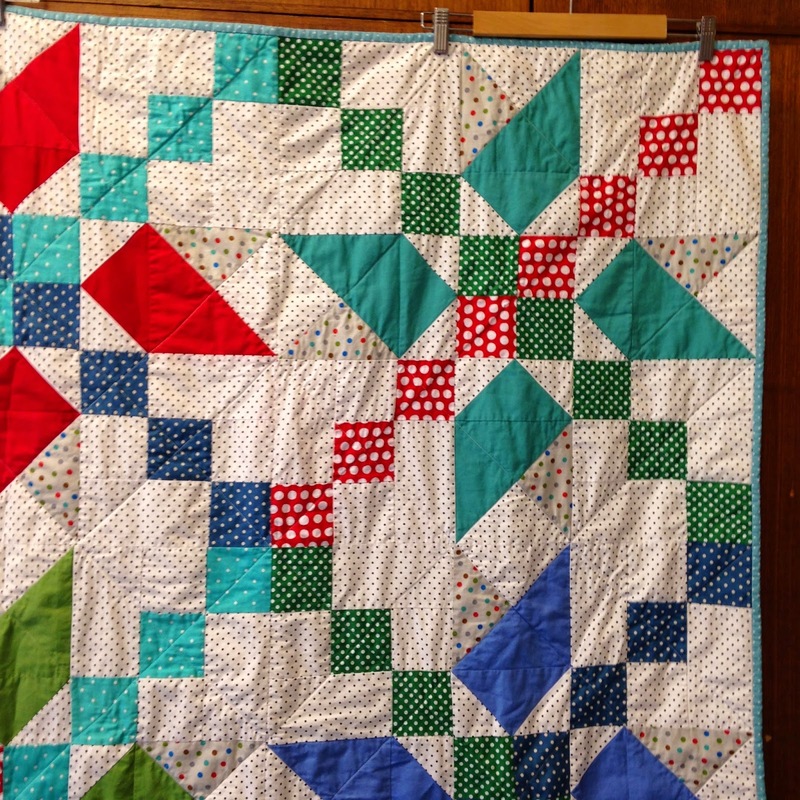 I really like the way the squares bring the blocks together like an irish chain quilt. I'm sure this will be a quilt that is used and loved! 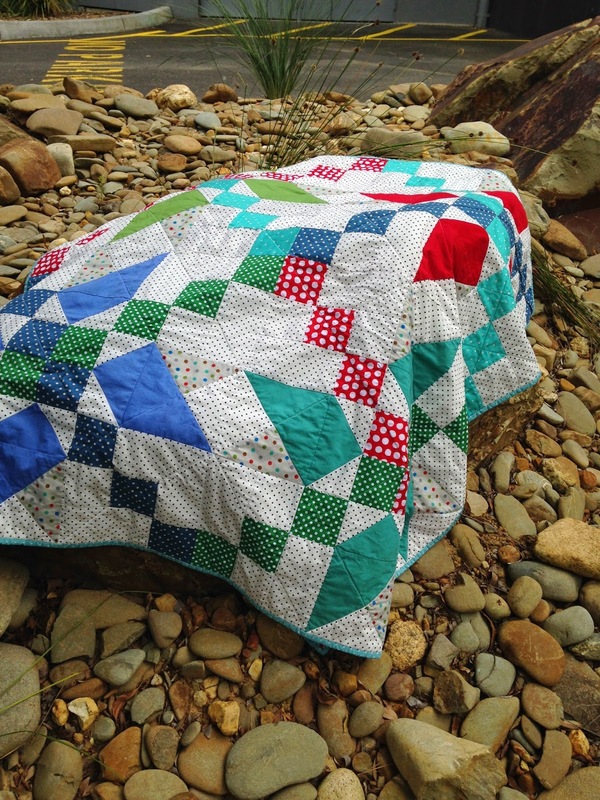 That looks like a fun, easy quilt with large blocks---perfect for a baby quilt! I know it will get lots of use! Bright and fresh looking - just right for a baby. I like how your color choices for the outside of the star make it look more like a pinwheel. Good for you using your stash! The pattern is pretty and utilitarian quilting is actually my favorite look for a quilt. I'm sure baby #4 will love it! fun quilt...love the name also. What a fun quilt! And what a fun way to start the week. I too am trying to work with just my stash this year. I'd love to try Star Jump with my stash! Thanks for sharing! Nice work! Your friend will be delighted to get it. A happy mom and happy baby indeed! This quilt looks like one that is going to be loved a lot! Star Jump 4 is just beautiful! I love it! Very very cool quilt! The dots are perfection!! It's a great pattern and I really like your spot fabrics. Good on you for using your stash. I'm trying to do that this year. It's a lovely quilt for a baby. No 4, wow! What a great design! Well done for using your stash (I LOVE polka dots!). Love it! 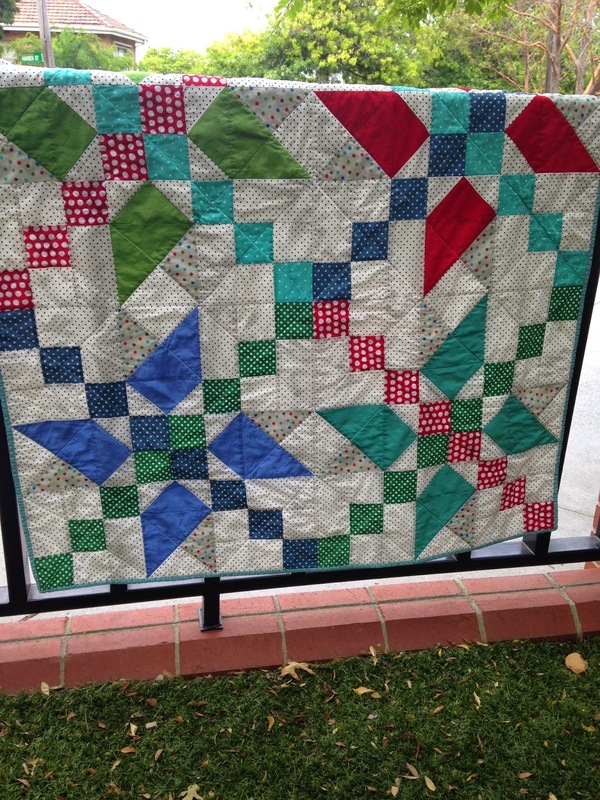 A fun mash up of a star/pinwheel/Irish chain quilt...and I love your color choices! Love it! Very eye catching! 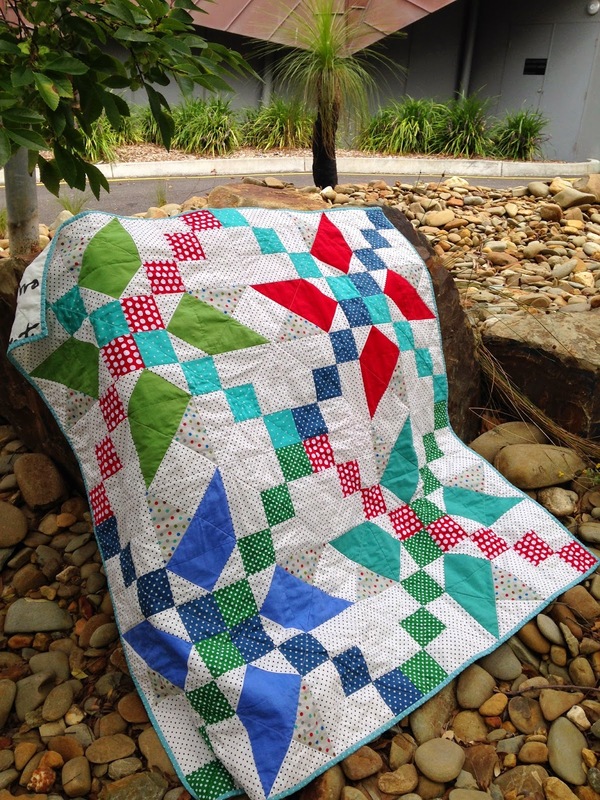 What a great way to trial a pattern, use up some stash, and end up with a quilt as a gift at the end!! Lovely finish!! It's a nice pattern,Susan, and I like even more that you pulled fabs from your stash. Your colors are super! I too need to sew from stash... after four quilt tops get quilted! Thanks for the giveaway chance! I love dots and the way you used them in this pattern is wonderful. I'm sure it will be used and loved. What an awesome quilt! I'd love the pattern. Super! The dotty background is PERFECT. what a fab finish! Great combination of solids and dots. I love your version and that you used your stash! That's a great quilt! I am sure it will be very loved! No need to enter me in the drawing, but I wanted to comment on your darling quilt! 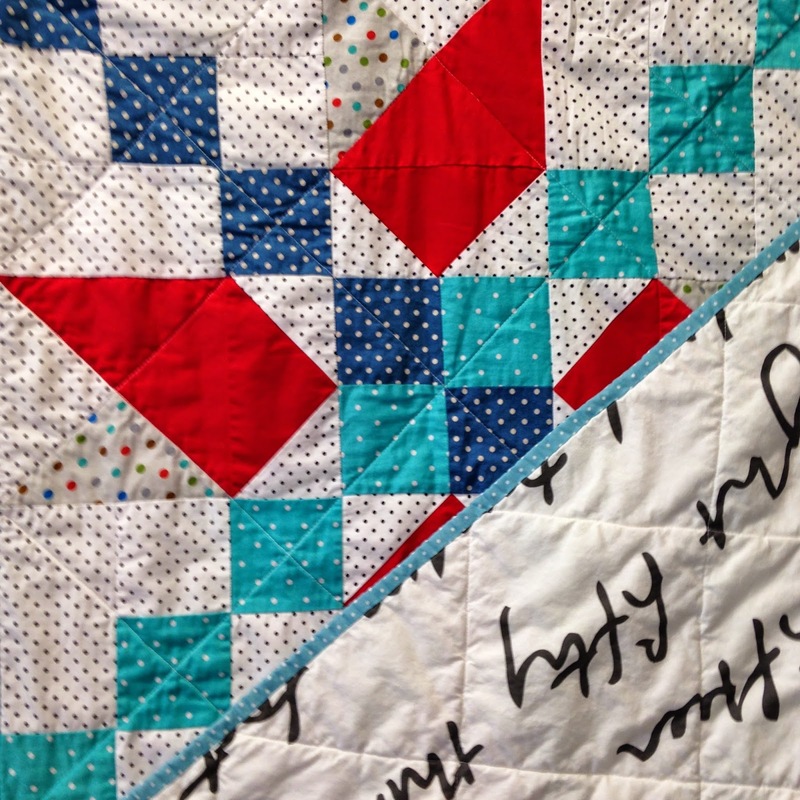 I love the idea of "less" quilting, esp. 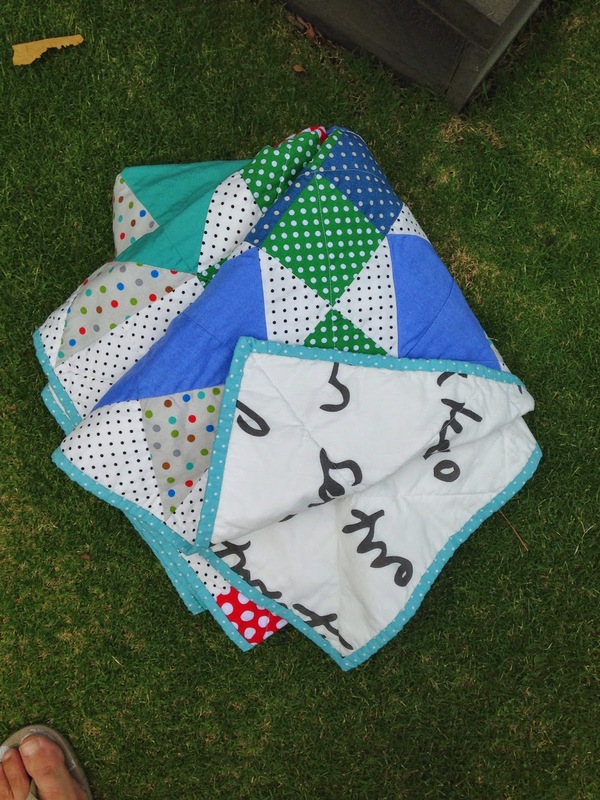 if it is for a wee one, as those quilts are so much softer and more drapable (and wrap able!) A terrific finish--so cute! Ohh that quilt is just too cute!!! Love the name of this quilt. And yay for stash sewing. That's what I'm trying to do for sure this year! So that would be the grey toned photo from a few weeks ago? I like the colour version too. Perfect fabric choices for a wee one, and good on you for using stash! This would be a fun quilt to make. It's like a "de-constructed pinwheel". Love it.